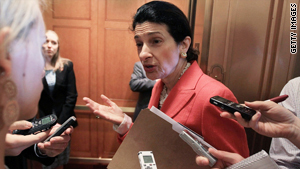 Sen. Olympia Snowe, R-Maine, opposes the military's "don't ask, don't tell" policy. Washington (CNN) -- Despite a high-profile push from pop star Lady Gaga and other gay rights supporters, the outcome of a key Senate vote Tuesday on whether to begin debate on legislation that includes a repeal of the military's "don't ask, don't tell" policy remains too close to call. Republicans appear united against the measure, including some GOP senators who favor lifting the Pentagon's requirement that gays and lesbians keep their sexuality a secret. The Republican opponents are upset that Democratic leaders so far refuse to allow GOP amendments to the broader National Defense Authorization Act that includes the "don't ask, don't tell" provision. Lady Gaga spoke at an afternoon rally in Maine to pressure the state's two Republican senators -- Olympia Snowe and Susan Collins -- to join Democrats in overcoming an expected filibuster attempt. To loud cheers from the crowd, Gaga said she was proposing a new law titled, "If you don't like it, go home," which would remove homophobic straight soldiers from the military instead of gay soldiers. "If you are not honorable enough to fight without prejudice, go home," she shouted. Without the support of the Maine senators, Democrats are unlikely to muster the 60 votes needed to proceed with debate on the defense authorization plan. Both oppose the policy, and Collins was the sole Republican vote in the Senate Armed Services Committee in support of getting rid of it. But in a statement issued Monday night, Collins said she would side with the rest of the GOP because the Democratic leadership of the Senate "intends to shut Republicans out of the debate." Collins said she agreed with the chairman of the Joint Chiefs of Staff, Adm. Mike Mullen, that the law is "simply not fair." But she said Senate Majority Leader Harry Reid, D-Nevada, should give Republicans and Democrats "an equal opportunity" to offer amendments to the defense bill. "Now is not the time to play politics, and I again call on the majority leader to work with Republican leaders to negotiate an agreement so that the Senate can debate the defense bill this week," Collins said. In a separate statement, Snowe also indicated she would support a Republican filibuster, saying the chamber should be allowed a full debate on the measure. Snowe also questioned why the Senate would vote on repeal before the military has completed its review. "We should all have the opportunity to review that report which is to be completed on December 1, as we reevaluate this policy and the implementation of any new changes," Snowe's statement said. The defense authorization act, which is a broad defense policy bill, would not rescind "don't ask, don't tell" until after the Pentagon completes a review of the repeal's impact on the military. The review is due in December and would serve as the basis for necessary certification by the president, defense secretary and chairman of the Joint Chiefs of Staff that the military could handle repealing the policy. Sen. John McCain of Arizona, the top Republican on the Armed Services Committee, said approving a repeal provision before finishing the review process would amount to an insult to military personnel. McCain also is unhappy that Senate Majority Leader Harry Reid, D-Nevada, opted to include in the defense bill a controversial immigration provision that offers a path to citizenship for students who are children of illegal immigrants. Reid "is turning legislation on our national defense into a political football," McCain said last week. "Politically controversial amendments are crowding out our limited time to debate actual military and defense-related legislation." A GOP leadership aide criticized Reid for planning to debate the "don't ask, don't tell" and immigration amendments before the Senate breaks for mid-term elections, even though Reid has said a final vote on the bill would not happen until a post-election session. "The vote tomorrow is not to get on the defense bill, it's to set up a series of votes on a political wish list," the aide said. Reid denied last week that his scheduling was motivated by politics. Defense Secretary Robert Gates and Adm. Mike Mullen, the Joint Chiefs chairman, have said publicly they support repealing "don't ask, don't tell." The military already has working groups looking at how it would implement the change if ordered. The groups are looking at everything from housing to entitlements, and even personal displays of affection. CNN's Chris Lawrence contributed to this report.